Liquorice has been used as a medicine by ancient civilisations and remains widely used to this day both in the West and in India and China. It is a “demulcent”, meaning that it has a soothing, anti inflammatory action on mucus membranes and may help to ease a sore throat or an inflamed digestive system. 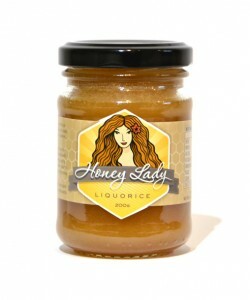 Liquorice honey also contains Fennel, a “carminative” herb, which means that it may help to relieve flatulence and bloating and reduce the discomfort of digestive cramping. Star Anise adds its wonderful warmth to this honey blend. Honey Lady Liquorice Honey is available in 200g, 325g & 700g jars and can be ordered at the Honey Lady Online Store or from one of our fantastic Honey Lady Stockists.